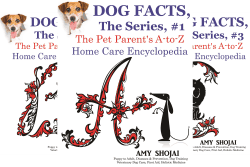 Dog Facts, The Series is drawn from the illustrated DOG FACTS: The Pet Parent’s A-to-Z Home Care Encyclopedia, a 550+ page fully illustrated trade paperback and Ebooks. Not everyone wants the entire book, though. I wanted the information as widely and easily accessible as possible, and so have broken up the book into individual alpha-chapters, with the back matter appendices included in each separate chapter. That way, you can access only the topics of interest of you, at a steep discount. Each chapter is priced individually from about $2.99-$4.99 (depending on number of topics covered), and each individual chapter includes the Resources, and a Breeds At A Glance table to help you choose the perfect feline companion, or understand the kitty who shares your pillow now. The Symptoms & Conditions chart encompasses all potential conditions/entries listed in the complete DOG FACTS book (not just this individual chapter), to help you identify the potential condition or cause of specific signs or symptoms your special cat might display. Amazon.com lists ALL the individual E-book series chapters here. For iBook, Nook, Kobo and other fine Ebook retailers, click the “universal links” below for the chapter(s) of interest. It’s far more economical to purchase the complete DOG FACTS: The Pet Parent’s A-to-Z Home Care Encyclopedia ($9.99 on Kindle, and $24.99 print book) that contains all 26 alpha-chapters, 200+ cute kitty pictures and over 550 pages of great cat info!